Last week I began teaching an introductory course on translation at the University College of the University of Denver. introductory course [that] addresses the essentials of translation theory, and basic translation skills that may apply to any language pair. Students will also learn how to address ethical issues that arise when translating sensitive and legal documents. I will post here my lecture notes, please let me know if you are interested in receiving more information. This course is open to all languages, and will strive to provide to all students the foundations on which to build in order to become professional translators. It will provide an introduction to translation, covering topics such as what translation is, how it differs from interpretation, what jobs are open to translators, and what resources are available to our profession. It will concentrate on the fundamentals that all translators should know: A deep knowledge of one’s own native language and of at least one foreign language is a necessary prerequisite, but, alone, it is not sufficient. 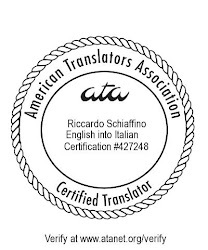 To become a translator one should also fully understand the subject-matter of the text to be translated, and have knowledge of things such as translation tools, reference materials, translation processes, and, above all, self-knowledge - knowing what one knows as well as an awareness of what one does not know. A very interesting course and hope to hear and read more about that in future. It is very good article... I like it. Because I'm taking this subject at Syiah Kuala University in Banda Aceh. Thanks so much. I get what I'm looking for.